In the two previous volumes of this series, Marvel Comics in the 1960s and Marvel Comics in the 1970s, the development of the company was traced through four successive phases: the early years, the years of consolidation, the grandiose years, and the twilight years with the latter phase assumed to have concluded at the end of the 1970s. That ending however, was always considered somewhat arbitrary as the twilight years, like the grandiose years before them, did not conclude with an easily identified marker let alone the too convenient year of 1970. There was a lengthy petering out period extending through the following decade with some top flight comics intermingling with a good many more of lesser quality until the former eventually dwindled away. By the end of the 1980s then, it was easier to tell that the twilight years as a definitive phase, was coming to an end, and another beginning. For the purposes of this volume that next phase has been designated as the “Dark Ages,” a period extending to the present where the content of comics was geared more to the adult reader than readers of every age and where creators and Marvel editorial seemed determined to squander the heritage bequeathed them by their peers in earlier phases. Also marking the 1980s or the later twilight years, was the start of Marvel's becoming a corporate football. It all began in 1968 when Magazine Management, owned by Marvel's founder Martin Goodman, was sold to Perfect Film & Chemical Corp. Renaming itself Cadence Industries, Perfect Film then sold its Marvel Entertainment Group to New World Pictures in 1986. Three years later, New World sold Marvel to McAndrews & Forbes owned by Ron Perelman who then steered Marvel Entertainment into bankruptcy and a tangle of corporate infighting that ultimately resulted in Marvel being bought by the Walt Disney Company in 2009. While all that was going on, the Marvel bullpen was also in flux running through a succession of editors-in-chief until finally settling on Jim Shooter who took the job in 1978. At the time, Marvel's offices were in turmoil with little editorial leadership. Books shipped late, reprints were used when deadlines were missed, and a maze of editors and editor/writers led to confusion that was often reflected in sloppy or self-indulgent scripting. Shooter managed to sort out the mess but at the cost of alienating many employees and freelancers who took offense. As the 1980s advanced, more and more of them would quit Marvel for the competition with the result that a moribund DC became resurgent and once again began to rival Marvel in sales and the quality of its product. Meanwhile, Shooter fought with the company's corporate bosses for better working conditions for employees such as sharing in royalties and ownership of characters published under a separate imprint than Marvel Comics. But despite his efforts, Shooter eventually found himself with few friends both in the bullpen and in the corporate offices and he was forced out in 1987. He was succeeded by his deputy, Tom DeFalco. More insidiously, a streak of darkness began to infiltrate itself into the comics themselves. Writers like Frank Miller and even Shooter himself infused characters such as Daredevil and Star Brand with broad strains of cynicism, negativity, and “mature” themes that were completely out of keeping with the spirit of the Comics Code Authority which began to lose ground as the decade progressed. As creators began to write more for each other than for their readers, unit sales of individual comics slipped at first slowly then more precipitously following a “bubble” that grew in the late 1980s until bursting later in the 1990s. The aftermath would not be a pretty sight, leaving behind a moonscape of anemic sales and comics the general public just had no interest in reading. But there was no hint of that as the 1980s began. At that time, Stan Lee and the great artists who had propelled Marvel's success in the 1960s were mostly gone from the scene and many of their 1970s acolytes, the fans turned pros, had either moved on to a growing independent market or defected to DC. Although there remained a few holdouts from the past such as Roy Thomas, John and Sal Buscema and Herb Trimpe (and later, Steve Ditko), they were replaced by new faces such as writers Roger Stern, Bill Mantlo, and Chris Claremont and a pair of writer/artists who would come to dominate the later twilight years, each attracting their share of fans and casting their influence over two distinctive wings of up and comers. First on the scene was John Byrne who broke in with a story in Giant-Size Dracula #5 (1975). Byrne's slick, detailed, exciting, perfect for super-heroes art style quickly caught the attention of readers as he moved from title to title until finally settling on the X-Menin 1977 just as that book was taking off on its meteoric rise to pop culture icon. Byrne's star rose with that of the X-Men (to mix a metaphor) until he left that title to both write and draw the Fantastic Four. There, he proved himself in both capacities producing wild and imaginative stories issue after issue that rivaled the heyday of Stan Lee and Jack Kirby. His contemporary, Frank Miller arrived at Marvel in 1978, debuting as penciler of the John Carter, Warlord of Mars strip. After serving a quick apprenticeship on a handful of titles, Miller managed to convince his employers to give him a regular assignment on Daredevil. There, over the next few years, Miller, first as just artist then as both writer and artist, would proceed to revolutionize not only the way comic stories were expected to be written and drawn, but their very content. In short order, the venerable Comics Code Authority, for decades the guardian of good taste in the comics industry and defender of reader sensibilities, came under increasing pressure with Miller constantly testing its limits. By then however, the Code had lost much of its mojo and offered little resistance so that by mid-decade, it was being routinely ignored by comics produced exclusively for a rising independent comics marketplace and then by newsstand versions as well. It was a process that ended at the turn of the new century when first Marvel and then DC abandoned the Code entirely. By the end of the 1980s however, both Byrne and Miller would do some abandoning of their own, leaving Marvel for DC. They joined a number of the company's most popular creators who preceded them there when growing dissatisfaction with editor-in-chief Jim Shooter nearly emptied Marvel's offices before a new tide of rising artists appeared to take their place. Todd McFarlane, Jim Lee, and Rob Liefeld would more than compensate for the loss as their new, manga influenced art styles grabbed readers where they lived and inspired a fanatical loyalty never seen before in the history of comics. With unit sales of the titles they worked on skyrocketing, the artists were joined by others in a subsequent exodus from Marvel to go into business for themselves as Image Comics. But despite record sales generated by Image in which every other publisher also shared, that bubble eventually burst, leaving only a new Dark Age firmly in place. It was left for those few remaining comics readers to stumble amid the wreckage until comics gained a different kind of respectability when Hollywood unintentionally gave them a new, if anemic, lease on life. But the damage had been done. Even though the names of Spider-Man, Captain America, Thor, and Iron Man would finally become well and truly household names, never again would comics themselves hold the kind of position in pop culture they enjoyed in the 1960s. With the abandonment of the Comics Code, the industry had turned its back on being a true mass medium and became satisfied as a niche phenomenon appealing to an ever shrinking base for which only constantly increasing cover prices could make up for subsequent losses in earnings. But it would take years for the company to reach that point. For most of the 1980s, sales remained relatively healthy as demonstrated by a vast expansion of the number of titles Marvel put out each year a significant portion of which involved licensed products such as toys, movies, rock and roll groups, and even biographies of John Paul II and St. Francis. Unfortunately, most of this output would prove less than stellar. For that reason, the format of this volume will be different than its predecessors in that there will be less first rate material reviewed in comparison with that of lesser merit. This was necessary in order to form a more complete picture of Marvel comics in the 1980s as, paradoxically, the quality of story and art declined even as production values improved. Thus, though the book may be heavy with entries for long runs of such consistently well done titles as Daredevil, Avengers, X-Men, andFantastic Four, there will also be just as many entries for such mid-range books as Star Brand and Squadron Supreme and bottom feeders like US1 and Kitty Pryde and Wolverine. 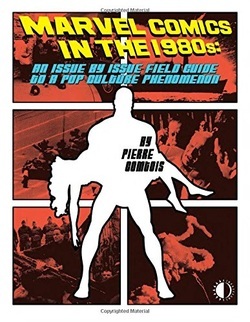 As with previous volumes however, the format of Marvel Comics in the 1980s remains the same with the text broken up into scores of separate entries each analyzing a particular comic book but able to be read in isolation from the rest or in conjunction forming a complete history/overview of Marvel Comics across that tumultuous decade.